Guyana made it two from two when they defeated the ICC Americas by 49 runs at Bourda yesterday in the second round of the Regional under-19 one-day tournament. Farham Malick is bowled by Steven Sankar for 26 at Bourda yesterday. Half-centuries from Askay Homraj who made 69 from 66 balls with seven fours and a six and Kemo Paul, who hit two fours and two sixes from 83 balls in his second consecutive fifty of the tournament, rallied Guyana to 229-9 when their 50-overs expired. A belligerent 35-ball 53 with five sixes and a four from the dreadlocked Onias Bascombe, 29 from Mikhil Dutta and 26 from Farham Malik kept hope alive before Bascombe was last out as the ICC Americas reached 180 all out in 43.3 overs. Leg-spinner Steven Sankar (3-25) and off-spinner Sharaz Ramcharran (3-15) were the pick of the Guyana bowlers on a good pitch to bat on. On a sun-kissed day at Guyana’s first Test venue the hosts won the toss and opted to bat first on a flat track and an immaculately manicured and lightening fast outfield. West Indies under-19 openers Tagenarine Chanderpaul and Shemron Hetymer both with First-Class experience, give the South Americans a firm foundation with solid and level-headed batting. The pair put together 49 for the first wicket with Hetymer climbing into left-arm pacer Kefir Phill; depositing him into the Rohan Kanhai stand with nonchalant ease while Chanderpaul elegantly whipped Phill to the mid-wicket boundary ropes in the same over. But Phill, who grew up in Guyana, got his revenge in his next over when Hetymer, who seems to be plagued by periods of impetuous shot selection, hammered one to mid-off after stroking 21 from 32 balls in the 10th over at 49-1. Skipper Brian Sattaur joined Chanderpaul, who pushed forward to a faster ball from off-spinner Nikhil Dutta and was trapped LBW for a 40-ball 18 at 59-2 in the 15th over. Paul was promoted to number four in the order and suppressed his natural aggressive style. He and Sattaur carried the score to 65-3 before Sattaur missed a sweep at left-arm spinner Delray Rawlings and was LBW for eight from 27 balls. Paul released the shackles with the first boundary in seven overs when he clipped Farhan Malik for four in the 25th over as the Combined Unit kept the handcuffs on the Guyanese batters with controlled bowling in conditions that had become very overcast. Ramcharran fell for 17 at 98-4 in the 34th over before Homraj opened up on medium pacer Onias Bascombe and deposited him over extra cover for a rare boundary as the batsmen continued to struggle at a ground where 63 Test tons were scored between 1930 and 2005. Paul gradually changed gear and pounced on a short ball from left-arm spinner Arsh Buch, hitting it over mid wicket for four to ease the pressure as the sun returned in all its glory. Paul reached his second consecutive half-century of the tournament in spectacular fashion with a colossal six over cover which rocketed off the top tier of the member’s pavilion. However, two balls later the 16-year-old Paul was stumped off Nikhil Dutta for a well calculated 51 to end a 44-run stand with Homraj who assumed the lead role with an array of delightful shots and intelligent running between the wickets after Balchand Baldeo was bowled for a first ball duck at 149-6. Homraj displayed his wide repertoire of shots and majestically pierced the off-side field with a stunning cover drive for four. But it was the aggressive intent from the Rose Hall Youth and Sports Club batsman which was the feature of his innings. Homraj caressed Bascombe behind point for his sixth four to bring up his fifty and the spectators in the full members pavilion were on their feet. Kemol Savory played an excellent supporting hand with his intelligent 19 and shared in a 69-run partnership with Homraj before he hit Bascombe to long-on at 218-7. 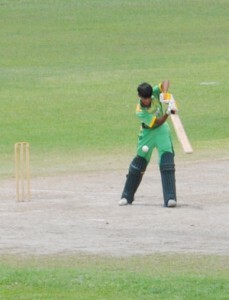 Askay Homraj gathers off-side runs in his 69 for Guyana at Bourda yesterday. The pint sized Homraj was removed by Bascombe at 221-8 before Sankar (8) was bowled behind his back, sweeping at Buch. When the ICC Americas began their reply Guyana opened the bowling with an all spin attack which accounted for both openers in the first two overs to leave the visitors on 6-2. Aniket Joshi (1) played back to Baldeo and was struck plumb in front, while Armaan Kapoor (4) was bowled by Ramcharran. 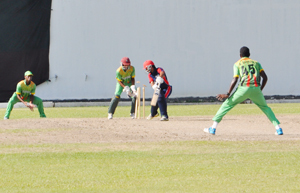 Former Berbice under-15 batsman Travis Ross, who now lives in the USA, and Nikhil Dutta joined forces but with the score on 22, Ross (5) hit Ramcharran to short extra cover as the Guyanese introduced two more off-spinners in Daimon Waldron from the north and Akil Wallace, who operated into a strong wind which assisted him in getting drift. Dutta and Malik repaired the early damage with a 50-run partnership with Malik sweeping Waldron for four and Dutta working the ball around nicely before Dutta (29) was run out by a direct hit from Hetymer at 72-4. It was soon 88-5 when Alex Dore (13) was caught behind off Sankar before Arjvn Parikh was hit on the inside of his right ankle by Paul and was forced to retire hurt on eight at 105-5. Malik played some delightful shots before he pushed forward to Sankar and was bowled for 26 to leave the tourists in 108-6. It was soon 131-7 when Sankar dismissed Buch (8) as the ICC Americas found themselves in further trouble. Bascombe launched a brutal assault on Waldron sending him into orbit twice off successive balls before hitting Ramcharran for another huge six in the next over. Ramcharran removed Delray Rawlings (1) at 154-8 before the powerful Bascombe dumped Waldron on top of the Cricket Board office, forcing Sattaur to introduce Chanderpaul who bowls with both hands. He started with left-arm spin and after Rawlings was run out at 170-9, Bascombe hit Chanderpaul on top of the Lance Gibbs Stands and brought up his fifty off the next ball, with another six before Chanderpaul had the last laugh when Bascombe skied a catch to mid-off to end the contest leaving Parikh unbeaten on eight. Today is a rest day and the competition continues tomorrow with Guyana facing Trinidad and Tobago at Bourda, while the ICC Americas come up against defending champions Jamaica at Everest.